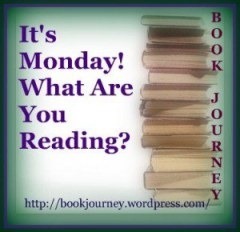 It’s Monday, January 19th, What are you reading? You are here: Home / 2015 / It’s Monday, January 19th, What are you reading? It’s Monday, January 19, 2015. It is Monday, and you know what that means–Hosted by Sheila at Book Journey, Monday is a great day to take stock of what you’re currently reading. I like it because it holds me accountable. And, because I succeeded at the 120 books read in 2014 (via Goodreads), I agreed to read 200 in 2015—I’ve done it before, and for many years read at least that many, but life has come in the way. But, beyond that, I want to publish more reviews this year. I have so many that I’ve written that have not been transcribed. I have celebrated 2 full weeks of posting every day—I know that’s a bit crazy of a thing to celebrate, but hey, it’s 2015 and I love the idea of celebrating ANYTHING when it comes to books! I posted some comic reviews here and here, and also discussed my bluetooth keyboard and where I went last week! I had very limited internet access at the resort, but I liked the fact I was able to upload reviews from my tablet and the bluetooth keyboard. I never even took the laptop out of my backpack, which was odd! I have read 14 books so far this year—this is well on my way to the 200 I hope to read this year! You had a great week! I love the idea of reading The Happiness Project during the corresponding month. I read it all in one gulp, but I think it’s probably better your way. I am always amazed at how many books some folks can read in a week. 🙂 I am lucky to get ONE done. :)I know three of the books you finished. I don\’t know any others.Amazing you have already read 14 books…wow…CONGRATS! !Have a wonderful rest of this week.